When young Alan Parrish discovers a buried board game outside his father’s shoe factory, he has no idea what kind of unimaginable power will be unleashed by playing it with his friend, Sarah. After an unfortunate roll banishes Alan to the jungles of Jumanji, 26 years pass before the game is played again and he is freed as a grown adult (played by Robin Williams). Siblings Judy (Kirsten Dunst) and Peter (Bradley Pierce) join forces with the grown Alan and Sarah (Bonnie Hunt) in an attempt to finish the game they started 26 years prior, as the only way to make the game stop is by completing it. This strange game is stacked with unfortunate events, appearing at each roll of the dice. Every turn moves them closer to the finish line, but it also unleashes more of the Jumanji jungle into the real world, so that soon there are exotic animals wandering the city and a jungle growing in their home. As unfair as the game may seem, it makes for exciting and unpredictable viewing each time one of them takes their turn. This high energy spectacle is also perfectly suited for the specific gifts of Robin Williams, who was family-film gold in the 1990s. 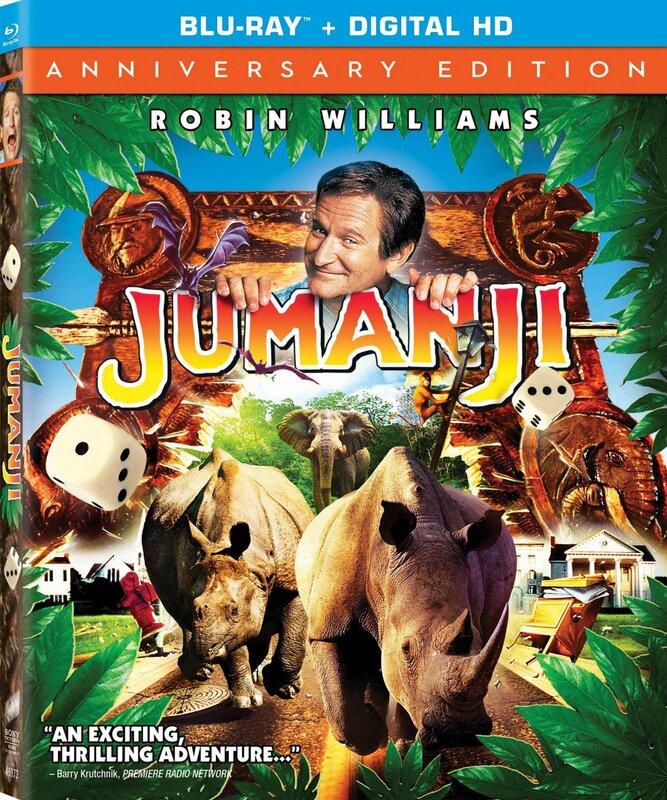 Although this Anniversary Edition includes some all-new extras, this isn’t the first time Jumanji has been released on Blu-ray. 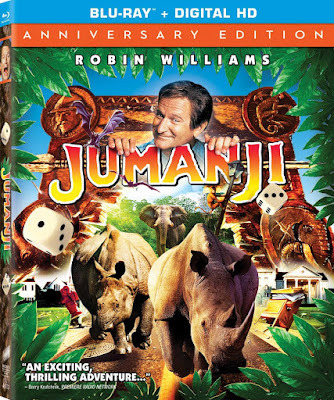 Included from past releases are the special effects crew commentary track, storyboard comparisons, a Jumanji virtual board game, and several behind-the-scenes featurettes. New to the Anniversary Edition are a few episodes from “Jumanji: The Animated Series,” a motion storybook read by Chris Van Allsburg and the original theatrical trailers. Also, in an attempt to cross-promote the new Goosebumps movie, the cast of the film talks about Jumanji. There is also a sneak peek of Goosebumps.